Home / À propos / What's new? The section of www.worker-participation.eu dealing with the overview of Health and Safety provisions in Europe as well as containing detailed infosheets on every EU Member State has just been updated. 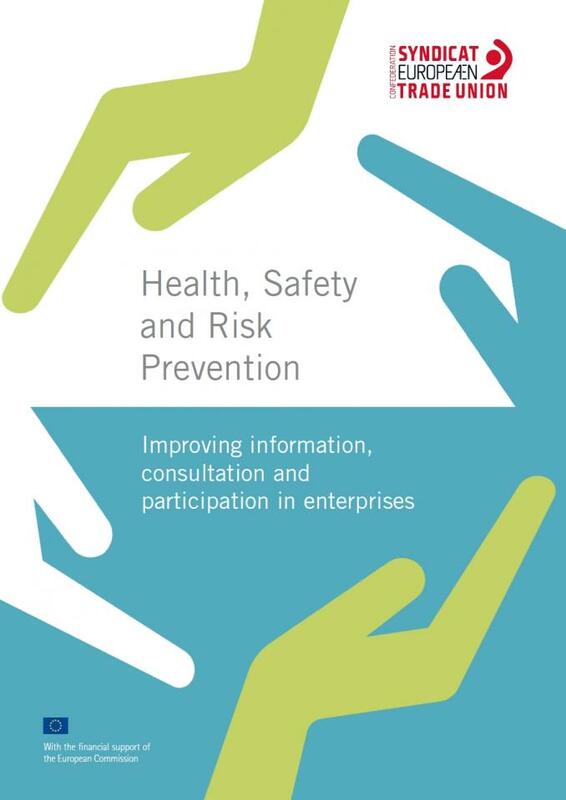 It now offers an expanded and up to date comprehensive insight into health and safety strutures, forms of representation and other relevant provisions. The proposed EU company law package, which was published in May 2018 by the European Commission, seeks to encourage cross-border company mobility while at the same time protecting stakeholder interests. 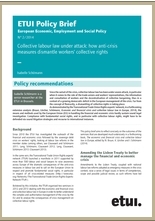 The ETUI’s GOODCORP network of company law experts has identified three areas where the package needs to be revised in the interests of protecting workers’ rights and discouraging corporate abuse and makes thirteen specific recommendations for amendment. These areas include: improving worker involvement rights; strengthening procedures for discouraging abusive behaviour such as tax evasion; and reducing the potential for fraud through online company foundations. On 27 June - 29 June 2018 the ETUC and the ETUI for the third time organised a conference: 'The World(s) of Work in Transition'. 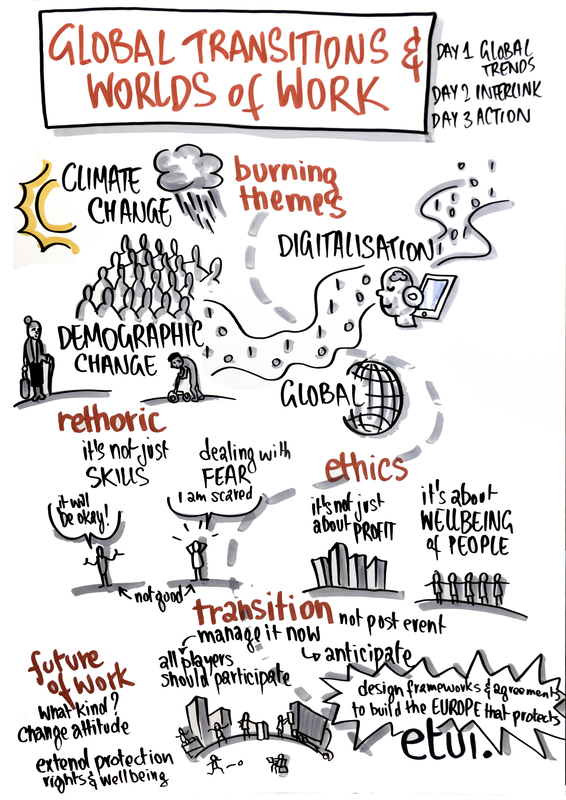 The Conference took place in Brussels and brought together over 600 participants to discuss four Megatrends impacting working life nowadays. First, the free movement of capital, services and people is altering the allocation of jobs throughout the European internal market. Second, climate change and the energy transition are making many occupations obsolete, while at the same time creating new ‘green’ jobs in emerging sectors and industries. Third, the demographic transition is changing the structure of the labour force and challenging social security systems. Finally, the digitalisation of the economy is set to disrupt the processes of production, employment and work conditions on an unprecedented scale. 1) Panel 3 - Company mobility fueled by digitalisation and Europeanisation: how can we shore up workers’ rights? 2) Panel 6 - The role of worker’s participation in addressing the digitalisation-driven Europeanisation strategies of MNCs. 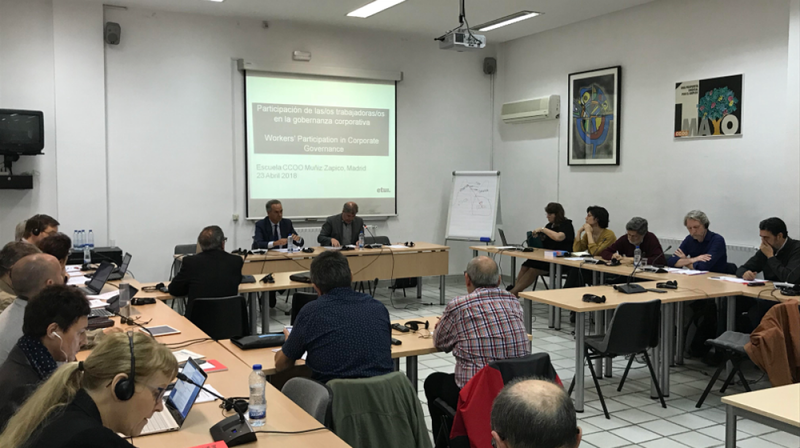 The EWPCC of the ETUI organized a workshop “Workers’ participation in corporate governance” on 23th April 2018, in Madrid (Escuela Muñiz Zapico from CCOO). The workshop had four main objectives: situate workers’ participation as a means to democratize the company in the context of after-crisis modernization of industrial relations in Spain, promote a theoretical-practical debate on the issue, illustrate with empirical comparative data on institutional models and existing practices of workers’ representation at European level, and finally, collectively learn from exchange of experience between workers’ representatives involved in corporate decisions in different companies and EU Member States. The law adopted by the German Bundestag on the 01 January 2016 setting mandatory quota levels for female supervisory board representation within both DAX registered companies and large co-managed companies appears to start having a real impact. 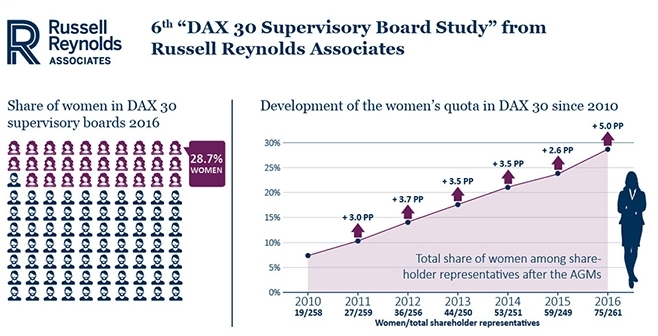 In a recent report (annual “DAX 30 Supervisory Board Study, 2018) consultancy company Russel Reynolds Associates indicated that for the first time the 30% female minimum threshold has been reached globally across the DAX registered companies. In the company that was the last to meet the quota requirements, the SAP’s, the supervisory board now actually stands at 56% versus 22% a year ago. Only five DAX companies are falling short, namely Adidas, Henkel, Infineon, Merck, and Continental and must urgently appoint female representatives. 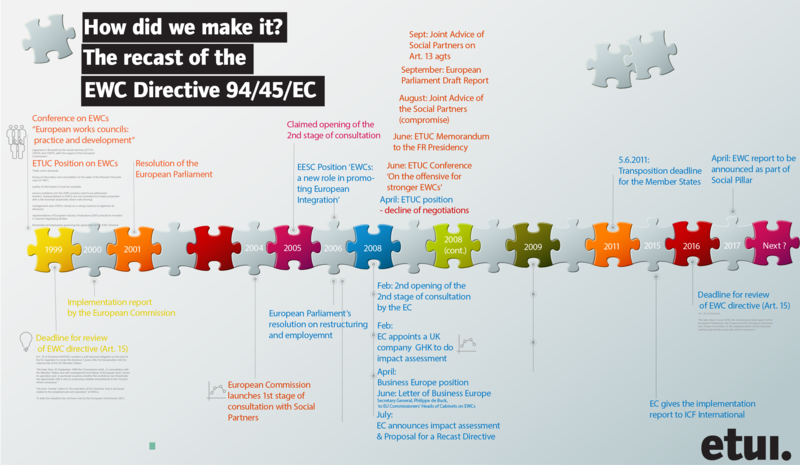 An overview infographic presenting milestones on the road to adopitn the EWC Recast Directive 2009/38/EC. 2) research evidence, facts, figures and findings concerning shortcomings and loopholes in the existing legal frameworks. Anders Carlson of the ETUI's expert network Workers' Participation Europe presents an update & overview of the last developments in the area of SEs in Europe. On the 26-27 April, 2018 the Hans Böckler Foundation and the European Trade Union Institute organised in Brussels another edition of the European Dialogue series of conferences. The conference's main theme was Strengthening Workers` Voice. This topic was discussed in view of the forthcoming elections to the European Parliament that are due to be held in May 2019. They will determine what chance we stand of continuing to develop a Social Europe fit to live in, with positive prospects for jobs and companies, or whether we shall be stuck with the task of defending Europe against its proliferating crew of political enemies. Vigorous democratic development of the social market economy will be decisive in determining the future of the European Union. What is the future of work? How to shape it? What's the role of workers' participation in this? These valid questions were addressed, among many more, in the recently (April 2018) published report 'Let's transform work' by Prof. Dr. Kerstin Jürgens, Reiner Hoffmann (President of the German Trade Union Confederation) and Christina Schildmann (Head of Commission on the Work of Future), published by the Hans-Boeckler Foundation. 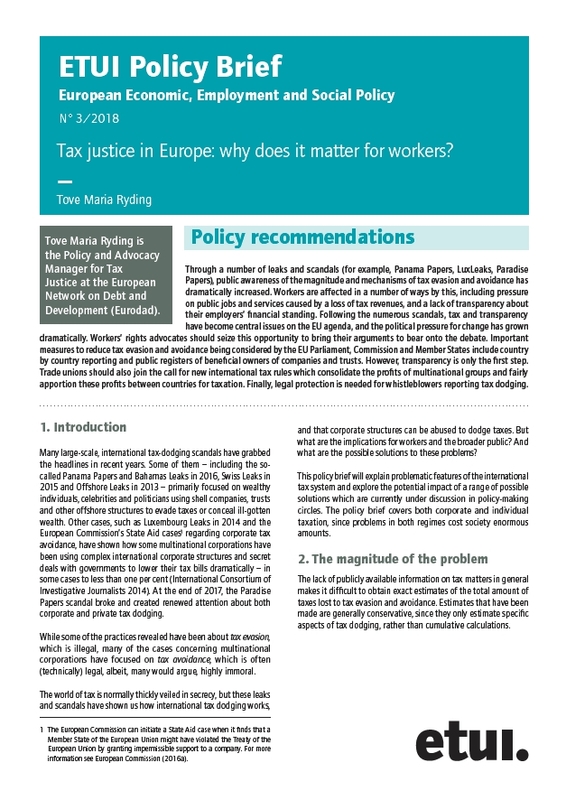 Tove Maria Ryding in cooperation with the ETUI's GoodCorp Expert Network casts light on the links between tax avoidance and how workers' voice be a countermeasure and a means to making companies more sustainable. Tax avoidance by corporations is widespread in Europe and costs governments more than €70bn annually. This revenue loss, and the legal ramifications of strategies that multinational companies use to avoid paying taxes, starves public services of funding, limits the bargaining power of trade unions and undermines employee rights. This ETUI policy brief outlines the scale of the problem, describes some of the ways that corporations limit their tax liabilities, and suggests some practical solutions. The brief shows that corporations have a range of strategies for avoiding paying taxes, including: declaring themselves to be multinationals; use of ‘transfer pricing’ to shift sales from high to low tax jurisdictions; and concluding secret tax deals with governments. Wealthy individuals also have a number of accounting and legal tricks available to them to conceal their assets. The 2017 revised Shareholder Rights Directive gives shareholders a say on executive pay and requires institutional investors to improve shareholder engagement. The directive is thus designed to provide a counterweight to the increasingly dominant ‘shareholder’ model of corporate governance which has put the interests of firms’ shareholders ahead of other stakeholders, including their workers. Drawing on the experience of the UK, Europe’s leading exponent of the shareholder model whose experience heavily influenced the Commission’s thinking, this brief analyses the workings of the directive, discusses its implications for worker’s rights and suggests how trade unions should respond. 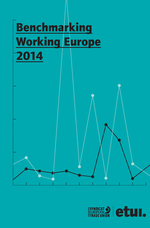 Benchmarking Working Europe 2018 is out! On the 20/03/2018 the annual report on socio-economic developments in the European Union in 2018 was published. The report is a common publication by the European Trade Union Institute and the European Trade Union Confederation published yearly since 2001 and features brief analyses, facts and figures as well as critical evaluation of developments in the EU. 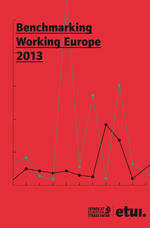 This year's Benchmarking Working Europe focuses on whether the European Union is really on the path towards convergence. Chapter 5 of the publication focuses on social policy-making and workers' representation. The EU-funded project “EWC Fit for Change”, led by the Austrian trade union GPA, drew upon the expertise of an international network of EWC experts and trainers (including from the ETUI) in order to develop materials to support European Works Councils in managing restructuring in corporate groups. The materials were developed and tested in three seminars with EWC members from several European countries and different sectors. These materials include a manual on transnational restructuring, in which the legal, political, strategic contexts are explained in order to better understand the dynamics of company restructuring and the opportunities available to EWCs to exert influence or get robust information. 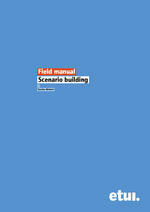 A number of very useful practical checklists are also included. There is also a guide to establishing an EWC and a set of advanced training modules for EWCs. The website of the project is available here in German and English and materials produced as a result of the project , available in German, English, French and Slovak can be downloaded here. 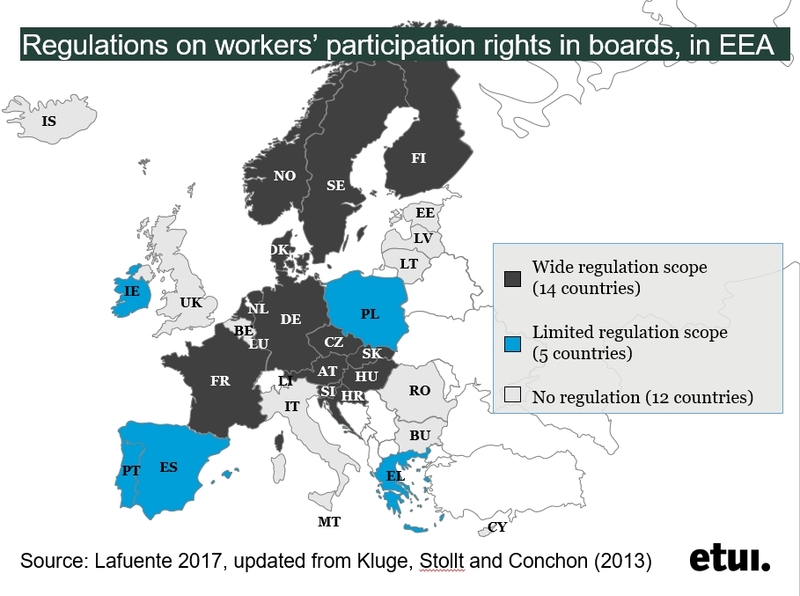 On the 1st of February, 2018 Sara Lafuente Hernández and Stan De Spiegelaere (researchers at the ETUI) published a very interesting piece on industrial democracy and workers' participation. The article was published in the online Social Europe journal. On 18 July, the CJEU quietly settled the ongoing legal struggle about codetermination rights in transnational companies in Case C-566/15 Erzberger vs TUI AG. In this preliminary ruling, German codetermination law has been declared to be in compliance with EU law. This judgement will satisfy those advocates of the argument that representation rights on German supervisory boards can be limited to workers within the German territory. The ETUI has recently published (January 2017) an updated map of board-level regulations in the EEA countries. The original map by N. Kluge, M. Stollt and A. Conchon (2013) was updated by the ETUI expert in the field, Sara Lafuente Hernandez. In 19 of the 31 members states of the European Economic Area countries there exists some legislation on employee board-level representation. Even in countries that have no legal regulations, such as Italy and Belgium, instances may be found (albeit exceptional) of workers’ representatives sitting on the company’s board as the result of a collective agreement. 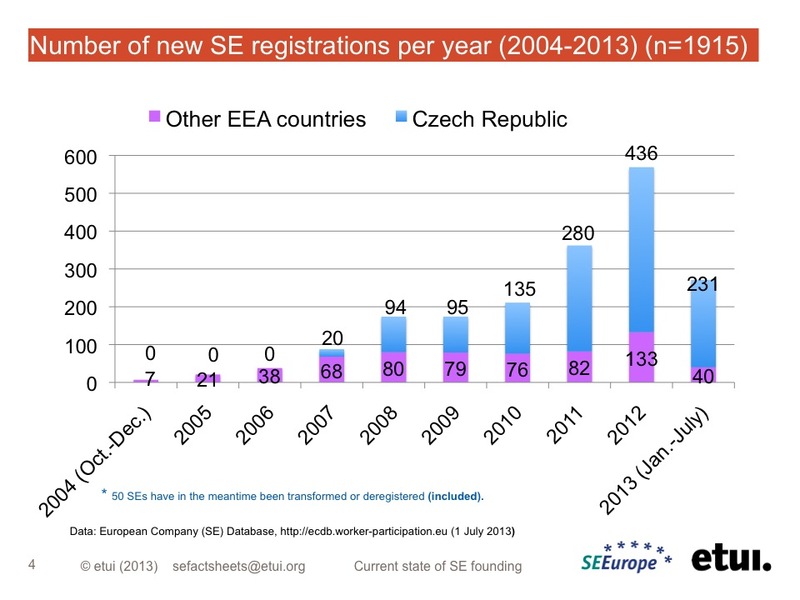 The situation in 2017 slightly changed from that of 2015, since board-level employee representation rules were reintroduced in the Czech Republic for the private sector in January 2017. Thus, this country is now back to the group of countries where regulations have a wider scope, covering both state-owned companies and the private sector. The updated situation is presented on the below map. Depending on the company structure in the respective member state, the workers’ representatives may either sit on the board of directors (in a monistic system with only an administrative board) or on the supervisory board (in a dualistic system with a management board and a supervisory board). In every country a specific system has evolved and (board-level) representation is always embedded in the wider context of the national industrial relations system. Consequently, the situation differs significantly among the member states. A national codetermination law does not breach EU laws on equal treatment or freedom of movement if it excludes workers in foreign subsidiaries from election rights to their parent company board. This is the Advocate General (AG)’s long-awaited opinion in case C-566/15 Erzberger (TUI), issued on 4 May. His recommendation to the Court of Justice of the European Union (CJEU) is based on the “current state of EU law” and ultimately on sufficient justification on grounds of the general interest. In the run up to the long announced and posponed announecement of the European Commission's report on the implementation of the EWC Recast directive the European Trade Union Confederation during its Executive Committee's meeting in Malta on 15-16 March, 2017. 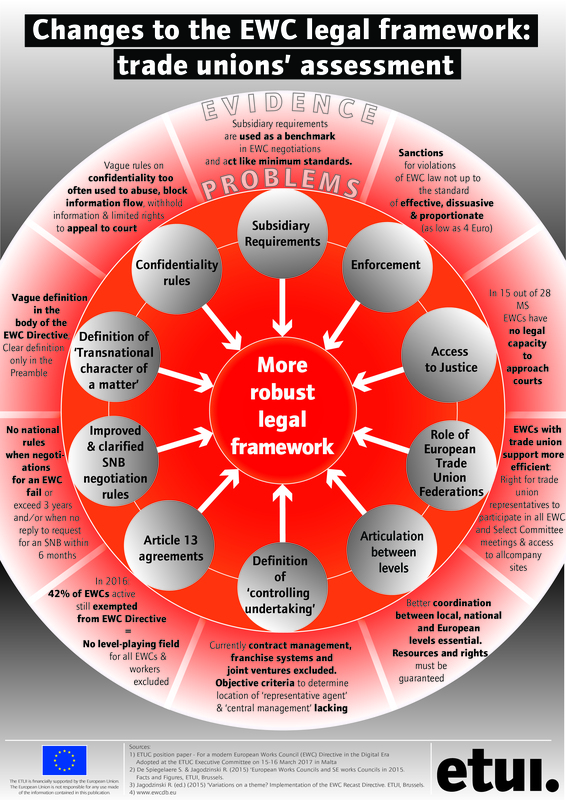 In 10 points the ETUC regroups its demands concerning amendments that the current legal framework requires. The ETUC's demands can be viewed below or the document downloaded from the ETUC homepage. 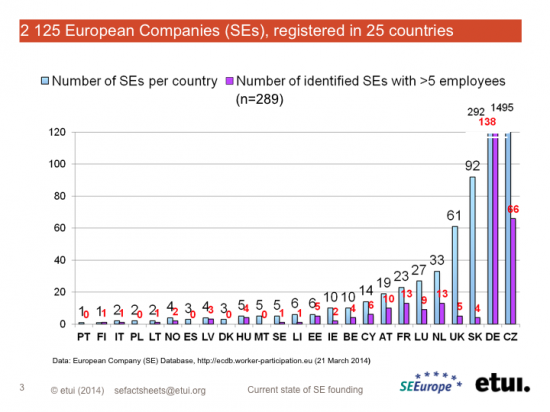 Anders Carlson, the chief tracker of the Workers' Participation Europe Network (formerly known as SEEurope Network) monitoring the developments in the area of SE companies across Europe has just published updated facts and figures on the topic. They can be downloaded in form of a pdf presentation. When using the data please refer to it as A. Carslon (2017) SE Companies in 2017. Workers' Participation Europe Network, ETUI. 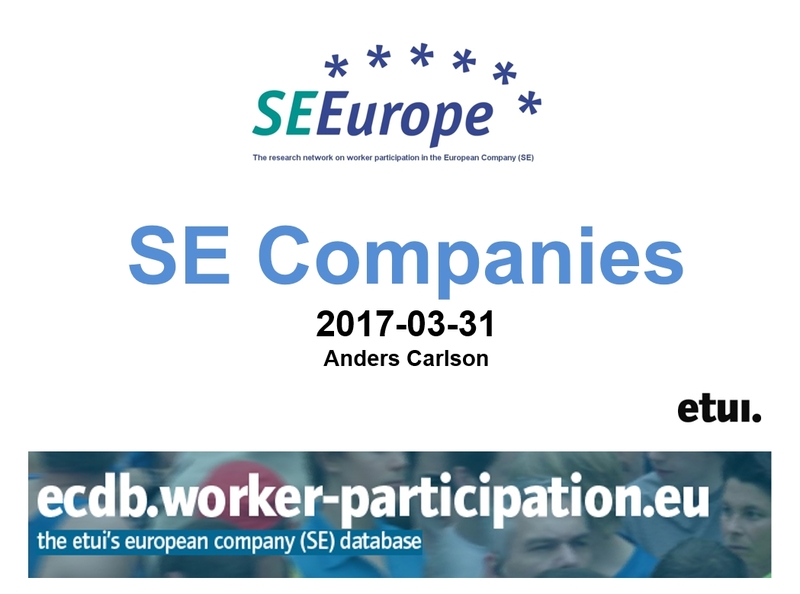 In its last session in London, UK on the 30-31st of March, 2017 the SEEurope expert network decided to change its name to Workers' Participation Europe network. This change in name reflects the thematic evolution of tasks and research interest of the network. 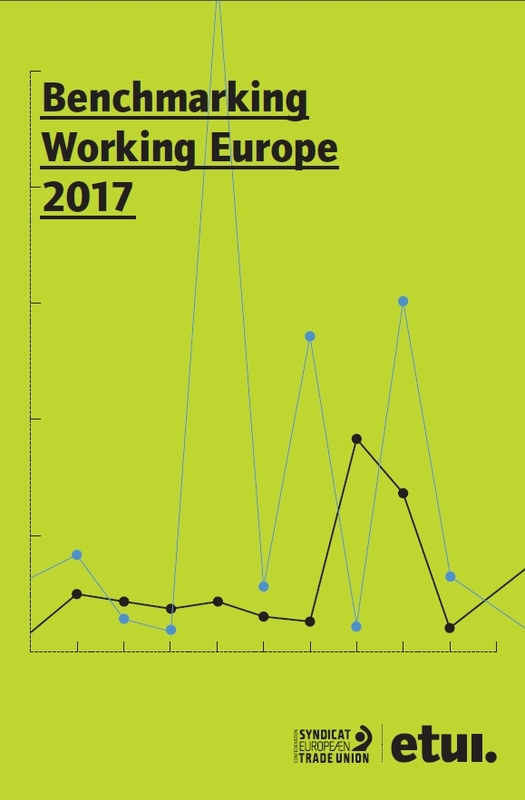 This 2017 edition of Benchmarking working Europe focuses on the question 'overcoming cleavages across the EU?'. It analyses in four chapters and with the help of 58 visual graphs latest trends and outcomes of European policies in the areas of macro-economics, wages and collective bargaining, labour markets and, last but not least, social dialogue and workers' participation. The Benchmarking working Europe 2017 demonstrates that the European Union is experiencing increasing social divergences and underlines the need for new policies that can generate higher living standards for all, based on fair integration and upwards convergence. 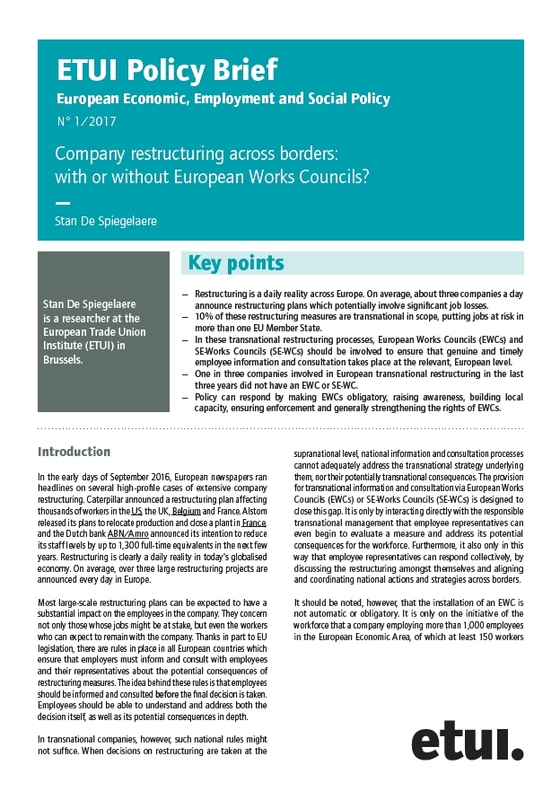 Company restructuring across borders: with or without European Works Councils? This policy brief takes as its starting point the fact that as soon as a company engages in European-level transnational restructuring, transnational information and consultation is needed to enable the social partners to consider the cross-border dynamic of the planned measures. Mr Erzberger, a minority shareholder of TUI AG – a multinational travel and tourism company headquartered in Hannover, Germany -- had brought a case before a Berlin court challenging the composition of the company’s Supervisory Board. According to German rules, the employees working for the group but outside German territory are not counted and therefore excluded from the election of board-level employee representatives since they have neither active nor passive election rights. The applicant argues that such geographical rules restrict the right to free movement of workers and also constitute discrimination on the basis of nationality, both of which would be contrary to EU law. On the 24/11/2016 in Milan a final conference of the ITEM project focusing on 'Fostering employee involvement at undertaking level by training the main players dealing with the European multinationals' took place. During the conference the main report including conclusions of the project was presented (attached in IT, followed by EN). On the occassion of the 20th anniversary of entry into force of the EU legislation on European Works Councils the ETUI (Romuald Jagodziński) published two articles on this topic. 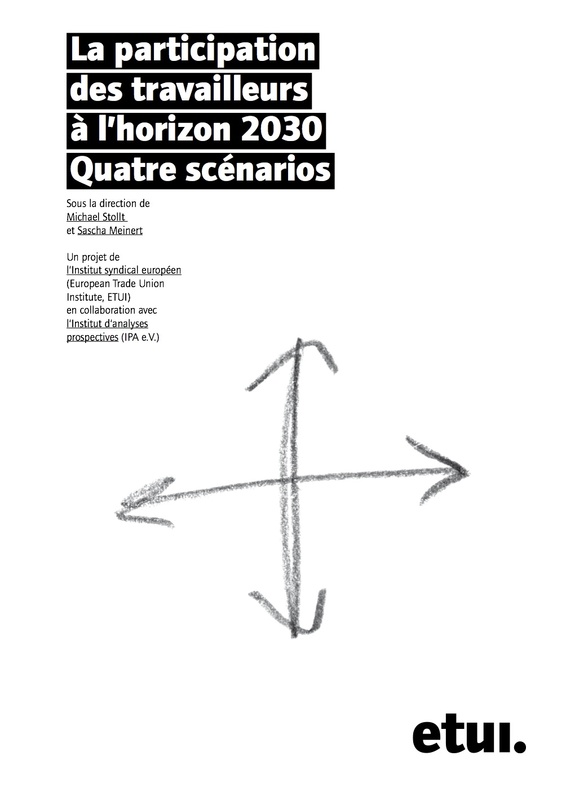 Both give an overview of the developments, main current characterstics, challenges and a future outlook. A European overview of various channels (works council, trade union) of employee workplace represenation, including minimum thresholds required to activate the workers' rights to representation. In its Workers’ rights in company law series the ETUI has just published (October 2016) a new book on takeovers and workers' rights, edited by Jan Cremers (University of Amsterdam) and Sigurt Vitols (ETUI). 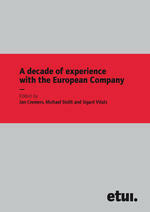 This book presents the results of a study of workers’ rights during company takeover situations in Europe. Takeovers are extremely important for workers because a change in ownership frequently leads to restructuring in the firm, including replacement of management, changed working conditions, increased work intensity and/or mass redundancies. It is therefore crucial that workers have strong rights to receive timely and full information about the planned takeover and to intervene at an early stage of the takeover process to protect their interests. The major conclusion of the book is that the EU Takeover Bids Directive needs to be revised, as it does not provide an adequate level of workers’ rights in its current form. The study was carried out by the ETUI’s GOODCORP network of academic and trade union experts on corporate governance and company law. The book includes case studies of takeovers as well as analyses of national legal frameworks regulating takeovers and of transversal issues related to takeovers. The book is the first in a new ETUI book series on workers’ rights in company law. The full version of the book is available for free download. Individual chapters can be downloaded freely from the ETUI website. Recently the ETUI's senior researcher Kurt Vandaele published updated information on strikes in Europe. and the participation in industrial action per 1,000 employees. Move forward in the interactive map by clicking on the forward or backward arrows or on individual countries to see detailed information per member state. Further questions and explanations to the data and strike activity can be found here. 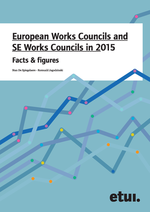 The ETUI's recent publication 'EWC and SE works councils in 2015. Facts and figures' (which is part of the 'EWC Recast evaluation infopack') has just been translated into German, French Italian and Polish. Alternatively they can be also downloaded from the ETUI website. 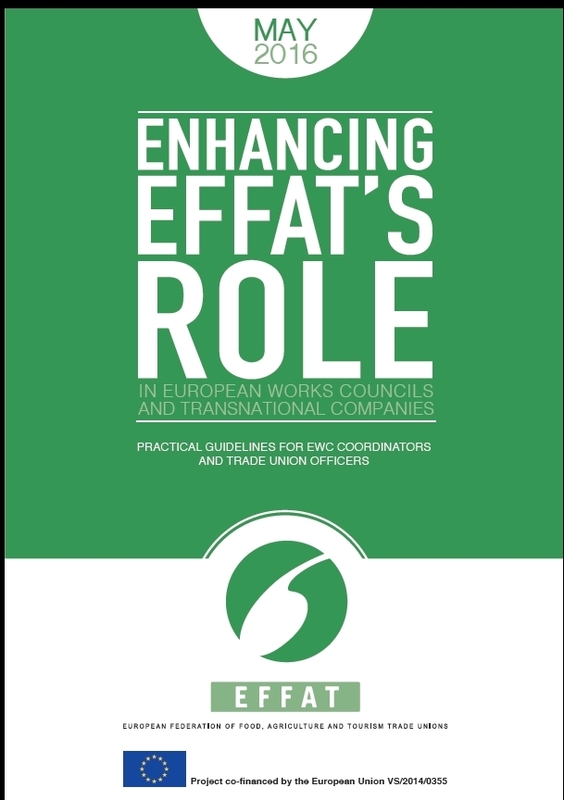 EFFAT – the European Federation of Food, Agriculture and Tourism Trade Unions – has recently published a practical guide for EWC coordinators and trade union officers. 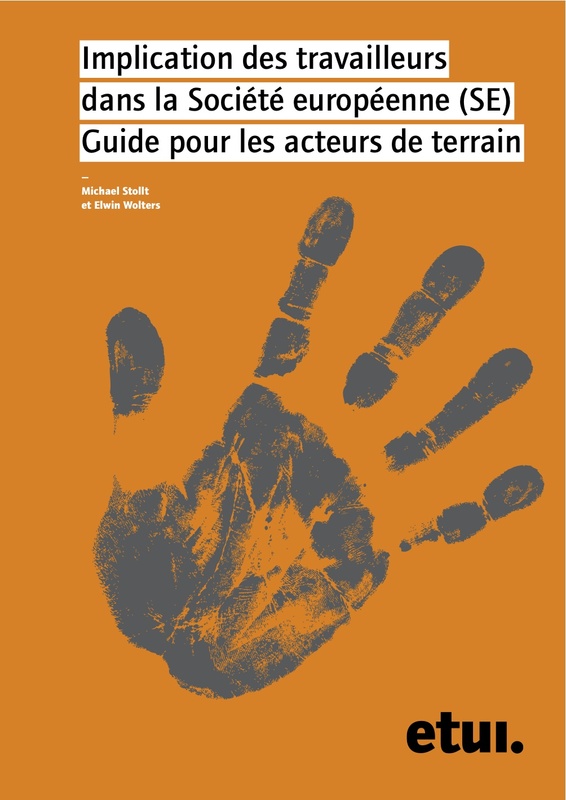 The guide is addressed to practitioners and offers a useful overview of topical EWC issues, ranging from the assessment of the EWC Recast Directive to transnational company agreements, psychosocial risks, handling information, precarious work, gender equality, social audits and more. The guide will soon be available in other languages. An essential must-read for EWC experts. In 2009, the long awaited (since 1999) Recast Directive on European Works Councils (EWCs) was adopted. 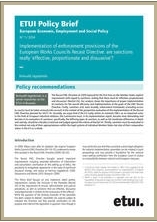 Its most important goals were to (1) improve the effectiveness of EWCs and (2) increase the amount of EWCs. In 2016, the implementation of the Recast Directive is to be evaluated by the European Commission that prepares its own report on the topic. 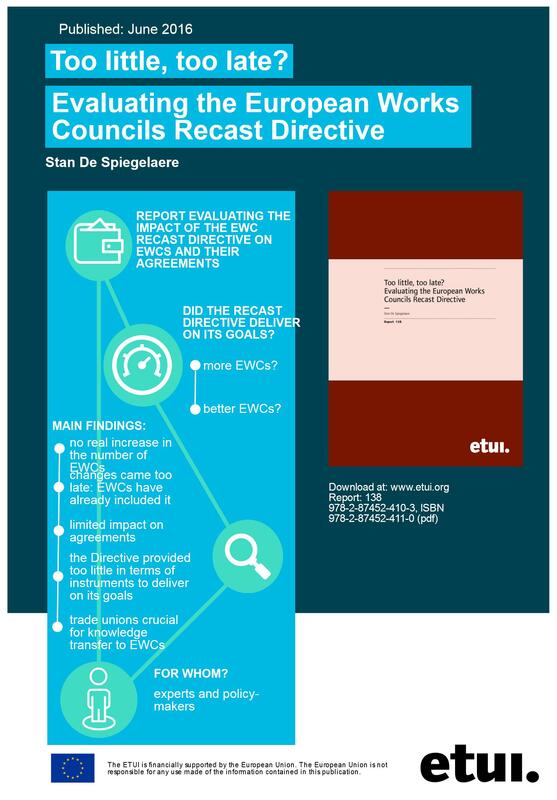 This report feeds into the evaluation debate by building on data from analysis of 1200+ EWC agreements stored in the EWC Database managed by the ETUI. The ETUI has just published a new Working Paper by Jeremy Waddington (ETUI and University of Manchester), Valeria Pulignano and Jeffrey Turk (University of Leuven), Thomas Swerts (University of Antwerp) on a very topical question of assessing the operation of European Works Councils. 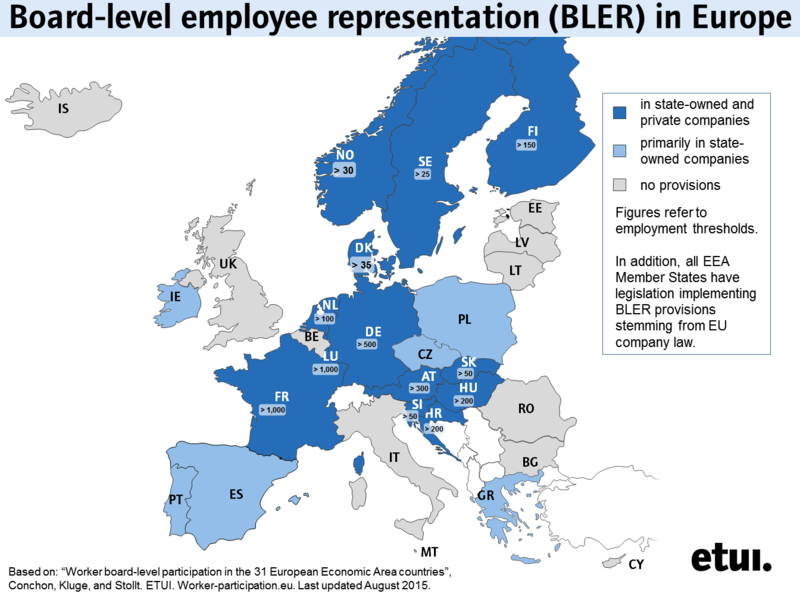 The ETUI has updated its map on board-level employee representation in Europe, which now provides the latest state of affairs in Europe and thresholds (in private-owned companies) entitling the workers to this form of representation of their intersts. 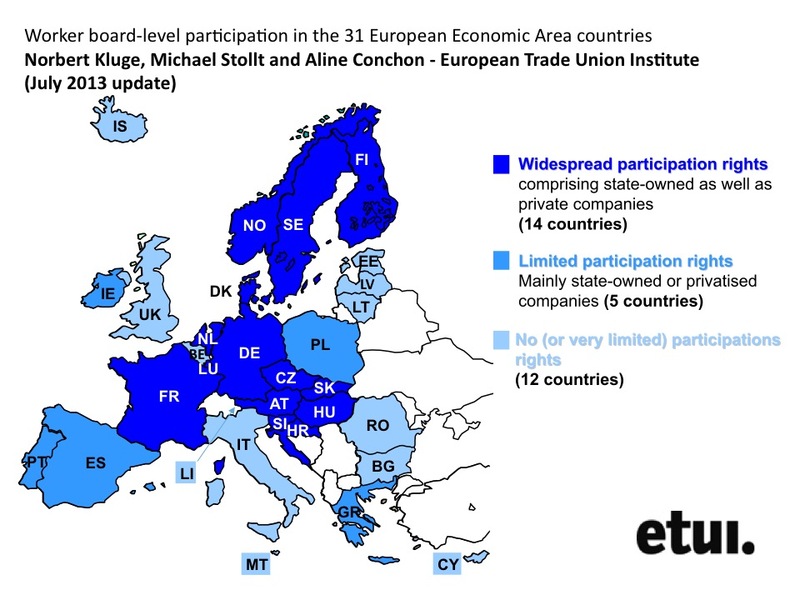 Interestingly, where workers have rights to elect their representatives to the board level overlaps with countries classified as having 'wide participation rights' according to the ETUI European Participation Index (2.0). Recast Directive on European Works Councils. The workshop was attended by top experts and academics in the field and provided for a much needed overview of EWC research completed and ongoing in the past 5-8 years. 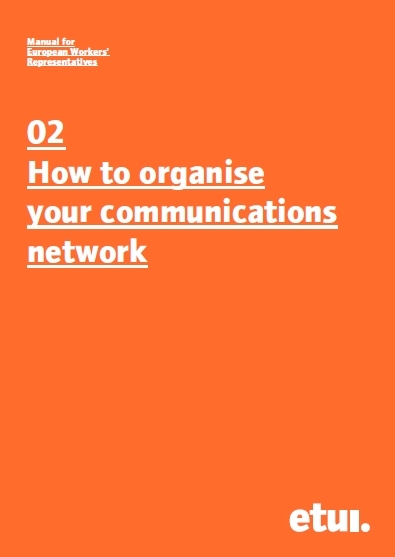 This second in a series of manuals for European Workers' Representatives explains in an easy-to-read format how European Works Council (EWC) members can organise and manage their communications network. It gives tips and tricks for better information flows and provides examples of best practices in several EWCs. The manual is available in 8 different languages. Each year the European Workers' Participation Competence Centre (a transversal platform within the European Trade Union Institute) organises a conference for worker representatives from all over Europe to exchange experiences, knowledge and skills necessary for worker representatives active in transnational settings and roles. This year's main theme is 'Building Bridges: combining information, consultation and board-level employee representation in European multinationals'. In other words, the conference focuses on the articulation, i.e. linking between various levels of information and consultation. In February 2016, to mark the 10th anniversary of the ETUI online portal on European Works Councils www.ewcdb.eu (available since 2006) received a completely new interface and design. The remake of the website was the ETUI’s response to users’ growing needs and a reflection of a change in access policy: we now offer full free access to all registered and many new features. Important: old logins and passwords (from before 22/02/2016) will NOT work --> please REGISTER ANEW. In December 2015 the Education Department of the European Trade Union Institute launches a new online portal devoted to trainign for European Works Council members and SE works council members. On 25-26th February, 2016 the European Trade Union Institute (ETUI) is organising a academic/research workshop on the EWC Recast Directive. The onset of the Great Financial Crisis in 2007/8 has triggered a widespread debate about the causes and the social and environmental consequences of the lack of long-term investment around the world. 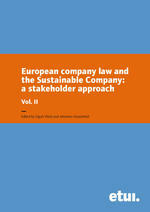 This volume, the third in the Sustainable Company book series produced by the GOODCORP network of academic and trade union experts on corporate governance, presents a ‘stakeholder’ approach to the problem. The analysis and policy prescriptions presented here go beyond mainstream economic analysis by highlighting the need for major changes in the way resources are saved, distributed and invested in the interests of a sustainable and just economy and society. Since 1994, the EU has established mechanisms for information and consultation procedures for workers in transnational companies (European Works Councils Directive 94/45/EC). 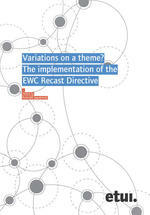 In 2009, the EWC Directive was reviewed and amended (Recast EWC Directive 2009/38/EC). The year 2016 will see the formal conclusion of a new evaluation procedure designed to ascertain whether the improvements of 2009 have had any impact on teh EWC's conditions of operation and whether any further amendements should be considered. 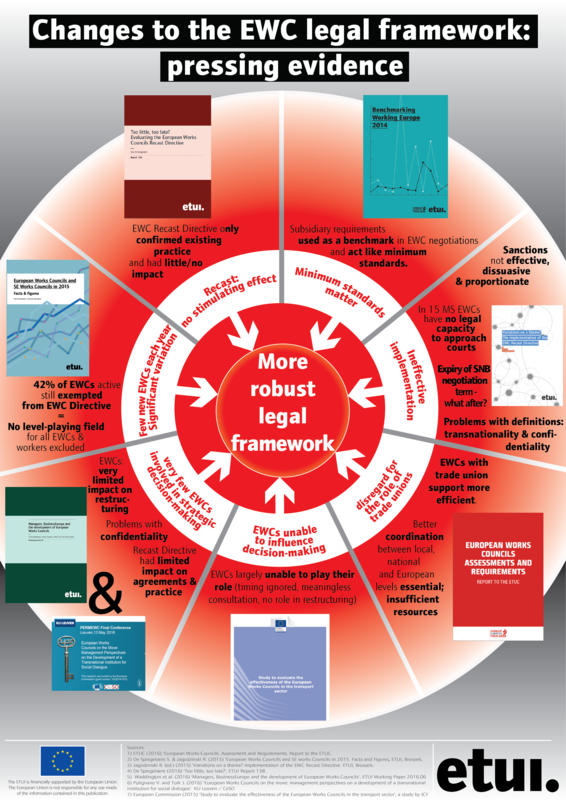 This book assesses in detail the ways in which key improvements brought about by the 2009 EWC Recast Directive have been implemented in national legislation. The three authors of this policy brief investigated whether multinational enterprises (MNEs) offer better terms and conditions for employment than domestic (non-MNE) firms. Using data from the WageIndicator web survey (www.wageindicator.org), the researchers compared wages, working conditions and job quality, working hours, training possibilities, and industrial relations at the workplace in MNEs and domestic companies. 3) introduce new rights to promote trade union involvement. The 2015 annual Conference of the European Workers' Participation Competence Centre (EWPCC) , 26-27 February 2015 in Brussels. As part of its series of conferences aimed at better understanding the multi-level dynamics of workers’ participation across national borders, this year’s EWPCC Conference turns its attention to the workplace level. The aim is to better understand the processes of information, consultation and negotiation at the local enterprise level. The target group are employee representatives as well as trade union and academic experts in this field.Over 180 participants from all over the EU registered. On 28/11/2014 the European Commission issued a proposal for a 'Directive on the protection of undisclosed know-how and business information (trade secrets) against their unlawful acquisition, use and disclosure'. The objective of the initiative is to ensure that the competitiveness of European businesses and research bodies which is based on undisclosed know-how and business information (tradesecrets) is adequately protected. Since the directive may have influence on worker rights to information and consultation in cases of merger of companies it is on the radar of trade unions. This policy brief demonstrates how the emphasis on the primacy of economic freedoms has negatively affected the application of EU social security rules and the working conditions of posted workers. It also discusses the legal ambiguities accompanying the notion of 'genuine undertakings' and some recent cases of abuse of the freedom of establishment through the spread of letter-box companies. Finally it formulates policy recommendations for clear, transparent regulation, tighter controls and closer cooperation between national law-enforcing authorities. The SEEurope Network, which focusses on workers’ participation issues, met in Zagreb, Croatia on 27-28 October 2014. The meeting was joined by 10 Croatian guests, including representatives of the two largest trade union confederations and academic experts. In the wake of the Croatian accession to the EU, this meeting enabled an intensive exchange about current and future issues in Croatian and European industrial relations. This policy brief by the ETUI shows the importance of proper implementation of sanctions for the overall efficiency and implementation of the goals of the EWC Recast Directive. By comparing national sanctions with the criteria of effectiveness, proportionality and dissuasiveness set by the EWC Recast Directive it highlights the excessive discrepancies between national regimes and the EU legislation. On this basis it formulates some concrete policy recommendations for the Commission’s future implementation report on this Directive. During the recent conference 'Europe at a crossroads. Which way to quality jobs and prosperity?' by the European Trade Union Institute and the European Trade Union Confederation organised on 24-26 September 2014 panel 3 was devoted to the question of future role(s) social dialogue may/should play as a tool in regulation of labour markets. 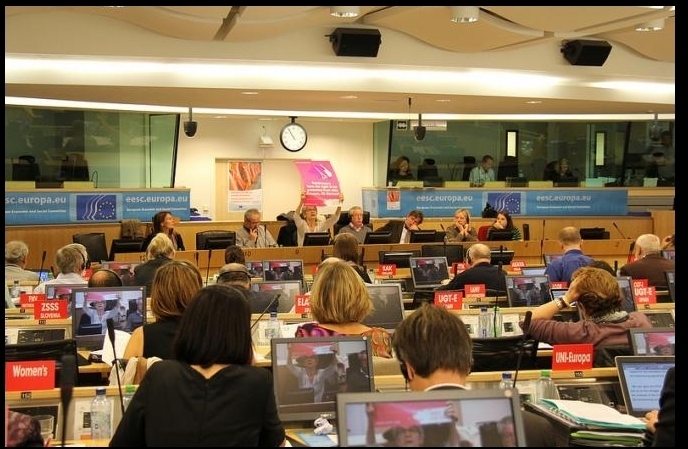 The Executive Committee of the ETUC in its meeting of 21-22 October 2014 adopted the Resolution 'Towards a new framework for more democracy at work'. The Resolution advocates a coherent and unambiguous approach to workplace democracy and calls for a Directive introducing a new and integrated architecture for workers’ involvement. Building on the existing EU acquis, the Directive should set high standards on information and consultation, and introduce ambitious minimum standards on workers’ board level representation as an additional source of workers’ influence. During the recent conference 'Europe at a crossroads. Which way to quality jobs and prosperity?' by the European Trade Union Institute and the European Trade Union Confederation organised on 24-26 September 2014 panel 16 was devoted to the question of worker participation and its position in the emerging European company law regime. News on European Companies: Slowdown or new dynamics? The publication is the outcome of an ETUC project intended to meet the new needs of trade-union teams, which require a better understanding of the European worker representation systems dedicated to health, safety and working conditions. The material consists of a 68 page long overview report (available in EN, FR, DE, ES and IT) and a package of country factsheets. The ETUI information service on EWCs www.ewcdb.eu has been online since 2007. After six years of operation, we are preparing for an upgrade in 2014. Therefore we are currently collecting input and feedback about the website in order to improve it and adjust it to the users’ current needs. We seek users’ remarks, proposals, and suggestions concerning the website’s contents, interface, and possible new functionalities, etc. We warmly invite you to participate in the survey on www.ewcdb.eu and/or to send feedback directly to Romuald Jagodzinski at rjagodzinski@etui.org. With your help we will be able to map users’ needs more efficiently and address those feasible within our resources. Thank you for supporting us in improving our service for you! The ETUI’s database of EWCs currently records 1,039 active EWCs in 962 multinational companies. The highest number of EWCs has been established based on the German (351), French (260), British (186) and Belgian (179) law. 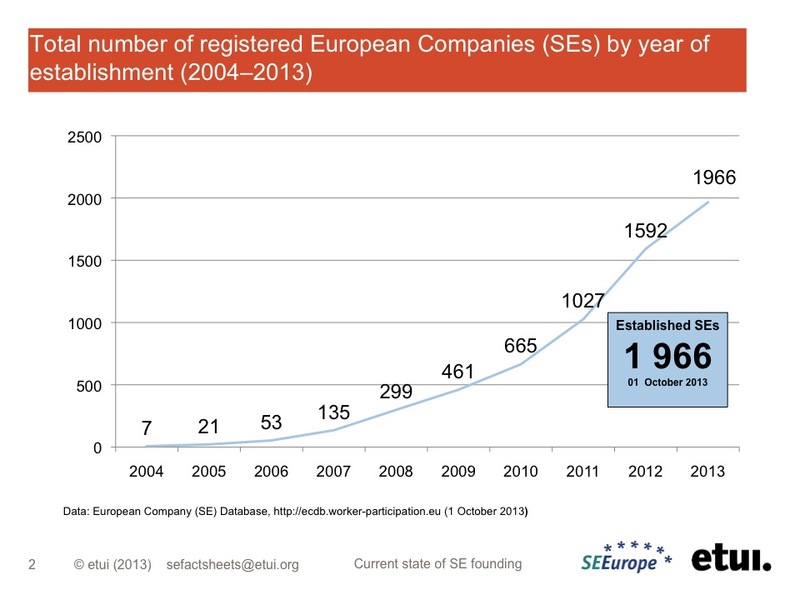 Since the entry into force of the recast EWC Directive 2009/38/EC, the pace of establishment of new EWCs seems to be increasing steadily: at least 58 negotiations are known to be currently underway, and the sectoral European trade union federations report that more initiatives to open negotiations are in the pipeline. Further statistical information can be found on the EWCD.eu-Website with ready-to-download charts. 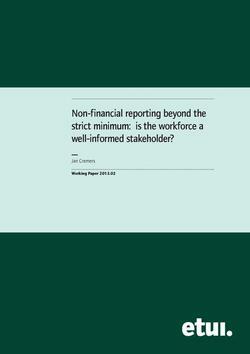 Non-financial reporting beyond the strict minimum: is the workforce a well-informed stakeholder? 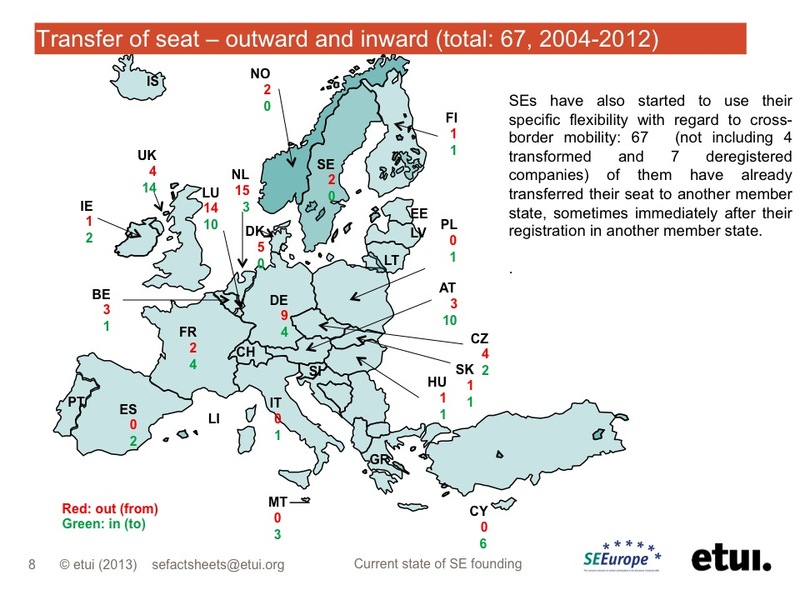 The SE Facts and Figures slides have been updated as well in lign with the latest SE data.